Do Good Lab partnered with the Vanavasi Ashram Trust to help their Pazhassi Raja School in Wayanad, India. The school was in need of a Jeep and thanks to our volunteers and donors we raised $5,000. Below are two pictures of the jeep that got purchased. Due to distance and geography of the landscape, it takes 6 hours to walk to the nearest village where supplies can be purchased and medical treatment is available. Also, some students are unable to continue their education because their parents have no transportation to return them to school after vacation. The Jeep will allow the Vanavasi Ashram Trust to acquire supplies for the school when needed, provide prompt medical assistance in case of emergency, and facilitate the return of students to school in order to continue their education. The Pazhassi Raja School is located in the rain-forest region of the Wayanad district of Kerala, India. The school is a six hour walk from the nearest village. The Wayanad district is home to many indigenous families. 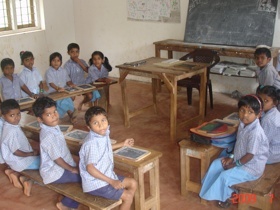 In 1996 a retired college professor named Dr. Nambiar decided to found the Pazhassi Raja School when he realized that most indigenous children in the Wayanad region had no access to education. Dr. Nambiar’s objective was to uplift the indigenous communities of Wayanad. 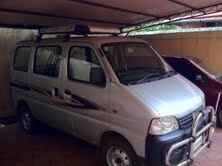 The Vanavasi Ashram Trust received a plot of donated land, and by 1998 they had build a number of temporary buildings. The school opened with 100 students–99 boys and one girl. Today, the Pazhassi Raja School has a well established infrastructure and widespread community support. The student body has grown to 212, and the 128 boys and 84 girls are all from local indigenous families. While almost all of the students live at the school during the school year and return home for the summer holiday, for some it is their only home. The ten teachers and 14 additional stuff serve the students during and after the school term. The parents are also very involved, working with teachers to grow vegetables and teach students skills in addition to academics, such as sewing, basket making,mat making, music, yoga, and archery. The Pazhassi Raja School has made itself a valuable asset to the community by providing much needed education and access to health services. With the dedication of staff and parents, the school believes that it can attract more children from the indigenous community. Fashion Night for Charity – August 26th! 6pm at Temple, 540 Howard St.
Posted by Thomas on Sunday, October 10th, 2010 at 1:34 pm and tagged India, Pazhassi Raja School, Vanvasi Ashram Trust.